I am a singer and my friend gave me Prefense just before a long run of a musical. When I get sick, I often lose my voice, so I was worried about staying healthy for this show. The two-month run just ended, and I stayed well while 75 percent of the cast and crew suffered thru a flu bug. Wow, I am sold! 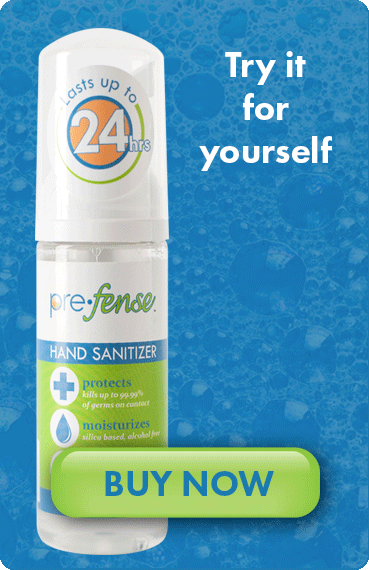 We brought Prefense hand sanitizer into our business after attempting to quantify in dollars how much we might be able to save as a result of regular use of the product by our employees. With multiple locations in several states, if we simply eliminate one sick day per month per location, the annual savings to our company can be in excess of $50,000. The initial reaction from our employees has been extremely positive. Our people like being healthy! I bought Prefense from my local retailer last spring when there was a flu outbreak, and no one in my family got sick. My children put it on every time they walk out the door. I have been telling everyone about this product. It’s the perfect way to protect yourself–and feels great on your hands! I enjoy the lemongrass scent and ease of use in the personal size Prefense I carry in my purse. It's not sticky or greasy like so many other products, instead it's a fresh feeling, not drying and I know I am protected. As a dentist, I spend my days washing my hands and wearing gloves. Prefense is the extra layer that I choose for the safety of my patients, team and myself. I like the science behind how the active ingredient is breaking down the things we don't see, and the confidence in knowing that it is working. My hands feel great and I love the scent. I'm making sure everyone knows about Prefense.